Lots of lovely things being said about Silver and Blood now – and lots of plaudits for the cover, done by Matti Gardner, working on a photograph by Alex Marrs – alexjohnmarrs@hotmail.co.uk. Next. they’ll be working up a cover for my follow up to Kicking Off, which is to be called They Came By Night – another big horror thriller featuring Rosanna (The Mouse) Nixon and Andrew Forbes. Now, here’s the review of Silver and Blood. It’s in the online reviewing mag (or whatever you call online phenomena) the IEBR, run by Cally Phillips, the novelist and playwright. 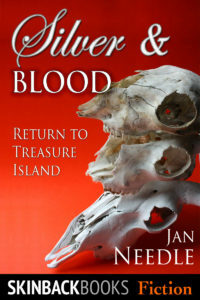 Jan Needle’s Silver and Blood: Return to Treasure Island is more than a return, it is a re-imagining – a re-imagining that gives the main characters an emotional credibility which is significantly different both from Stevenson’s original and from Andrew Motion’s recent novel Silver: Return to Treasure Island. Unsurprisingly Jim is soon way out of his depth and Needle pulls off a masterstroke by introducing his version of Long John Silver into the confused and violent scenes that follow the captain’s death. This is much earlier than the character appears in Treasure Island itself. He has no name at this point, merely “a low voice, warm and friendly.” He wears a suit and tie and has “a broad tanned face, not like a criminal at all” – which merely goes to show how little poor Jim knows about wickedness at this stage. Jim has so much to deal with – fear, lies, pain and diarrhoea. It’s not surprising that his early encounter with Long John Golding’s reassuring, masculine strength has filled an emotional void that not all Golding’s subsequent betrayals can finally erase. This imaginative subtlety makes Silver and Blood an adventure story to be enjoyed by older children and adults alike. Here’s the link, which will lead you to other reviews. It’s a good and useful site, and I’ve done a couple of reviews on it myself. All reviewers are professional writers. For anyone who doesn’t know it, Authors Electric is a good site, too. A daily blog by about thirty professionals (including me).